Ah, the bathroom. No home can be without one, yet many are simply unexciting. This most functional room in the house often does not receive as much love and attention as it should. Those who are budget-conscious often do not want to spend a great deal on custom or fancy toilets, and many toilet options end up being white. Then, they may just match the tile to the toilet and then all you have is a plain white bathroom. But if you are ready to spruce up your lavatory, why not make it exciting, attractive and maybe even with a spa-like feel? If you have a tub that's barely used in your home, why not convert it to a beautiful walk-in shower? After all, most people prefer showers to baths for the purposes of regular hygiene. HouseLogic's recent spotlight, dubbed "Stop Hating Your Bath," offered an array of advice for how to improve your bathroom. One suggestion outlined how to swap out a tub wisely. If the only bathroom in the home has a tub, it is not the greatest idea to remove it. This may devalue the home in the long run. Also, it is not the best plan to put a walk-in shower if the existing tub already has a window above it. The source advised that this may cause mould issues in the long term. And finally, be sure that you make the correct measurements and tile your shower so it fits the space. Those seeking more guidance can stop in at their kitchen and bath showroom to speak with professionals. If you do not want to entirely re do your bathroom, you can make small changes to prompt the feeling of luxury. Swap out outdated bathroom faucets for those that look sleek and modern, or perhaps install a new rain-style shower head. Alternatively, look for a height-adjustable shower fixture that enables everyone in the house to get clean in comfort. The Huffington Post added that other details can boost the spa-like ambiance in your bathroom, like picking up a towel warmer or bringing some plants into the space. Try out some unique colour palettes to bring in more natural, earthy tones. A pale blue shade of paint can feel soothing, and grey tile may also look trendy and reminiscent of rocks under water. 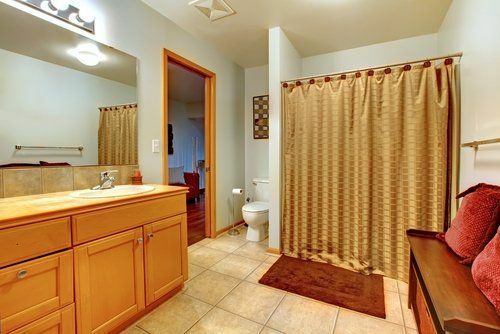 When you have settled on shower, tile and fixture options, feel free to accessorize the space. Some neutral artwork or photography can elevate the room, while attractive storage options can personalize the space to you and your loved ones.